The goal has always been to make the transition both from AMS to rF2 as well as from other rF2 cars and tracks relatively seamless, and we´ll point out a few ways to better bridge those gaps. 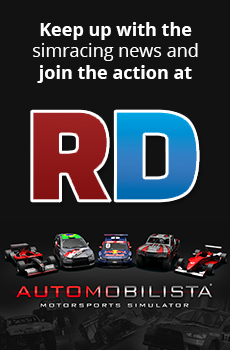 Automobilista is free to play this weekend! Celebrating Brazilian Stock Car "Race of the Million" taking place at Goiania this Sunday August 5th, Automobilista is currently free to play on Steam until sunday evening. For those who still don´t know AMS, this is a chance to check out one of the highest rated racing simulators on the market free of charge! Furthermore, Automobilista is currently on sale with 25% off and the Season Pass for all DLCs is 50% off, so if you enjoy AMS you may purchase everything with a special discount to continue playing after the free trial period elapses. Automobilista v1.5.1 is now out - includes a new Drift Series & Game mode, F-Ultimate 2018 series, an updated Interlagos, a comprehensive AI revision, snowed in Buskerud Ice track and a whole set of further updates and fixes. V1.5.1 is the conclusion of developments that hadn´t been quite wrapped up in time for v1.5 release, along with some bug fixing and general maintenance. Save for some essential bug fixing for an eventual hotfix (and the final DLC, still TBA), this update should conclude Automobilista development. Hopefully it´s been made worth the extra waiting time! Race Rank works by submitting results from Qualifying and Race sessions on official Reiza Servers. In Qualifying points are awarded for the top 20 qualifiers who set a time with in 107% of pole position. Race points are awarded for upto the top 20 finishers, as well as leading a lap, fastest lap and places gained. The maximum points possible is achieved by coming first, pole and fastest lap. There is no other combination that scores higher. A qualifying session counts for 1/6th of a race. This base score is then scaled depending on the quality of the opponents on the server, the race length and the number of opponents, this then gives you a base score from this event. This means it’s hugely beneficial for you to take part on servers of around 20 drivers. Automobilista v1.5.0 is now out - includes new official multiplayer ranking system, a beautiful new kart track, new realism features and more ! V1.5 is the culmination of years of simulation development, and the definitive version of Automobilista. Here we are then for the final dev update of the year, just in time for what is to be the final major update to Automobilista. We have a lot of new good stuff to show you this month The next v1.4.9 update is going to be packed with several valuable developments and new content so that´s what we´ll be covering in this month´s dev update. For v1.4.9 @Alex Sawczuk has undertaken a complete revamp of the native HUD system to feature a lot of the valuable information seen in DynHUD & other 3rd party systems along with a brand new TV overlay system, which the added bonus of being fully fed & rendered in-game and neatly arranged into a single overall design. This should hopefully reduce the needs for DynHUD & other external HUDs (though these will remain as functional alternatives for those who may prefer them). Automobilista v1.4.8 is released - includes new DLC release as Brazilian Touring Car Classics are now available! Automobilista has been updated to v1.4.76 - this update intends to address crash issues that have come up, following in particular a recent Windows 10 update. The update also brings several other valuable updates & fixes to the sim. IMPORTANT: Please note that in this update DynHUD has been disabled by default while some reliability issues are worked out - if however you were not experiencing crashes or any DynHUD-related problems you may enable it back on by unticking the option to disable it in AMS Config. For Nvidia Users: We have introduced advanced AntiAliasing settings in the Config application, your settings should be auto upgraded, but feel free to take a look and adjust as you please. To begin with we´ll be sharing a little more detail about the main features from the recently released v1.4.5, before moving on to the exciting new things due to come up next! AMS V1.4.5 has seen the long-anticipated addition of the new 2017 Stock Car Brasil season, featuring the new Chevrolet Cruze bodywork, along with all 30 drivers & liveries from the current season. The Curvelo race track (aka Circuito dos Cristais) which debuted in the series last year has also been added - both the longer layout raced in 2016 as well as the shorter version raced for the very first time just a week ago. Automobilista v1.4.5 is released - includes new free content as the Stock Car 2017 season & Curvelo race track are now included! Hello everyone! We´re back for another Automobilista Development Update - not many of these to go now! It´s actually getting a bit tricky to share many details about what we´re doing in these final stages of AMS development as we´re getting more into exploring new grounds and doing some experimenting without knowing for sure what will pan out and how soon - that naturally makes it harder to provide much of a foresight without feeding expectations that may not be realistic on the short term. With that in mind this month´s update is mostly retrospective on the work done for v1.4, while still providing some glimpses as to what comes next!